Dr. Santha Vaithilingam is an Associate Professor and Head of Department of Econometrics & Business Statistics, Monash University Malaysia. She is also the Cluster Leader for Industry, Market and Social Analytics under the Global Asia in the 21st Century (GA21), which undertakes economic modelling and data analytics of the regional economies and industrial sectors in the Asia-Pacific region. Her research interests are in computable general equilibrium (CGE), financial econometrics, and behavioral economics. More recently, she has been working on modelling human behavior pertaining to technology adoption and its impact on economic development in the region using advanced econometrics techniques. She has published articles in international journals and has also presented in several national and international conferences and forums. Jointly working with Centre of Policy Studies in Monash University Australia, she assisted The Ministry of Finance, Malaysia in the development of the Malaysian Dynamic Computable General Equilibrium model for macroeconomic and industrial policy formulation. Assoc. 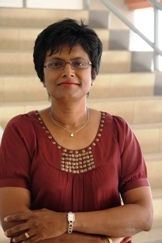 Prof Santha is also supervising PhD students in the areas of behavioural economics and financial & technology policy formulation. She is also a panel member of International Evaluation Panel for external research grants at Monash University Malaysia. Priyanka Puri, Manjit Sandhu, Vaithilingam, S., (2018), Air transport securities in Malaysia, Air Transport Security, Issues, Challenges and National Policies, (pp: 199-230). ISBN 9781786435200: Publisher: Edward Edgar Publishing Limited. Liew, E.J.Y,, Vaithilingam, S and Nair, M. (2014), “Social Network Technology and Socioeconomic Behaviour,” in editor Ramasamy, R., ICT Strategic Review 2014/2015, PIKOM and KMMM, Malaysia. Kuppusamy, K, and Vaithilingam, S. Capital markets: Islamic versus Conventional, Islamic Business: Contemporary Issues and Economic Development; ISBN 978-967-400-231-2. Nair, M. and Vaithilingam, S. (2013), “Innovative use of ICT among urban-poor communities: challenges and opportunities,” in editor Ramasamy, R., ICT Strategic Review 2012/2013, PIKOM and MOSTI, Malaysia, 181-191. Krishnan Guru, B., Vaithilingam, S., Ismail, N. and Prasad, R. Electronic Banking: The Ultimate Guide to Business and Technology of online Banking-Electronic Banking in Malaysia: A note on Evolution of Services and Consumer Reactions (pp. 135-149). ISBN 10: 3528057548; Publisher: Springler-Verlag New York Inc.
Ng, J.W. J, Vaithilingam, S., and Rangel, G.J., (2017) "The Role of Life Satisfaction on Election Voting Preferences in Malaysia", Asian Journal of Social Science, Vol 45, pp. 149-175. Ng, J.W.J, Rangel, G.J., Vaithilingam, S., Pillay, S.S. (2015). “2013 Malaysian Elections: Ethnic Politics or Urban Wave?”, Journal of East Asian Studies. Ng, J.W.J, Rangel, G.J., Vaithilingam, S., Pillay, S.S. (2015). “The Authors Respond – Interpreting Ethnicity and Urbanization in Malaysia’s 2013 General Election”, Journal of East Asian Studies. Crosling, G, Nair, M and Vaithilingam, S (2015), Creative learning ecosystem and innovative capacity: a perspective from higher education, Studies in Higher Education, Volume 40, No.7, 1147-1163. Vaithilingam, S., Nair, M., and Thangaraju, T. (2015), “Managing money laundering in a digital economy”, Journal of Asia-Pacific Business. Volume 16, 1, 44-65. Liew, E.J.Y.L, Vaithilingam, S., and Nair, M. (2014), “Facebook and Socioeconomic Development in the Developing World,” Behaviour and Information Technology, Vol 33, Issue 4, pp.345-360. Vaithilingam, S.; Nair, M., and Krishnan Guru, B. (2013) “Do Trust and Security matter for the Development of M-Banking? Evidence from a Developing Country”, Journal of Asia-Pacific Business Volume 14 Issue 1, March 2013. Nair, M. and Vaithilingam, S. (2013), “Leap-frogging the Urban-Poor to a High Income Economy: A Case Study From a Developing Country,” Journal of Emerging Economies and Islamic Research, Volume 1, Number 2, 1-27. Vaithilingam, S., Nair, M. and Samudram M.,(2010) “Trade Liberalization, Financial Deepening and Economic Growth in a Large Developing Economy: The Case of India” Economic Bulletin, Vol 11, December. Vaithilingam, S. and Nair, M. (2009), “Mapping Global Money laundering Trends: Lessons for Pace Setters”, Research in International Business and Finance, Vol. 23 Issue 1. Samudram, M., Nair, M. and Vaithilingam, S. (2009), “Keynes versus Wagner on Government Expenditures and Economic Development: The Case of a Developing Economy”, Empirical Economics, Vol. 36, Issue 3. Samudram, M., Nair, M. and Vaithilingam, S. (2008), “Human Capital and Endogenous Growth in a developing Economy: Evidence from Malaysia (1970-2004)”, International Journal of Economic Research (IJER). Nair, M., Samudram, M. and Vaithilingam, S. (2008), “Malaysian Money Demand Function Revisited: the ARDL Approach”, Journal of Asia Pacific Business, Vol. 9, Issue 2. Samudram, M. and Vaithilingam, S. (2007), “Trade Liberalization and Financial Development: Malaysian Experience”, Economic Bulletin, Vol. 8, December. Nair, M.and Vaithilingam, S. (2006), “Modeling Malaysian Natural Rubber Supply Response Function Startegies and Policies to enhance Competitiveness, Journal of International Business and Economics (JIBE) (ISSN: 1544-8037). Vaithilingam, S., Nair, M. and Muthi Samudram (2006), “Key Drivers for Soundness of the Banking Sector: Lessons for Developing Countries”, Journal of Global Business and Technology (JGBAT), Vol. 2 No. 1 Spring. (ISSN: 1553-5495)..
Vaithilingam, S., Nair, M. and Krishnan Guru, B. (2005), “Private Sector Financing on Economic Growth in Malaysia: Results from Bounds Test”, The Journal of Academy of Business and Economics, Vol. V, No. II, 2005. ISSN: 1542-8710. Vaithilingam, S., Krishnan Guru, B. and Shanmugam, B. (2003), Bank Lending and Economic Growth in Malaysia, Journal of Asia-Pacific Business, Vol. 5, No. 1 2003. Krishnan Guru, B., Vaithilingam, S., and Shanmugam, B. (2002), Cash Management of Malaysian Banks, Journal of Asia-Pacific Business, Vol. 4, No. 3, 2002. Krishnan Guru, B., Avvari M. and Vaithilingam, S. (2001), Customer Satisfaction of Commercial Banks: A Malaysian Case Study, Banker' Journal Malaysia, No. 116, Dec 2000. Krishnan Guru, B., Vaithilingam, S., Ismail N. and Prasad, R. (2000) Electronic Banking in Malaysia: A Note on the Evolution of Services and Customer Reactions: Journal of Internet Banking and Commerce (JIBC) June 2000, Vol. 5, No.1. Krishnan Guru, B, Vaithilingam, S., and Sigamani, V. (1999), The Impact of Cash Flow Fluctuations on Banks', Banker' Journal Malaysia, No.112, Dec 1999. Selvarajah J., Nair, M., and Vaithilingam, S., (2018) “Does Microfinance Deepen Socioeconomic Wellbeing of Urban micro and small entrepreneurs? Evidence from a Developing Country” presented at the 26th EBES conference in Prague from 24 to 26 October, 2018. Selvarajah,J., Nair, M., and Vaithilingam S., (2015) “Behavioral Intention to Use Microfinance: A Developing Country Perspective” at 2nd International Symposium on Partial Least Squares Path Modelling. The Conference for PLS users. June 17th and 18th, Seville Spain. Liew, E., Vaithilingam, S. and Nair, M. (2015), “Quality of Regulatory Governance and Affordability on Information Seeking Use and Economic Benefits of Facebook in a Developing Country," 11th International Conference on Technology, Knowledge and Society, 23-25 February 2015, University of Berkeley, Berkeley, California, USA. Chua, J.M., Ng, J.W.J., Vaithilingam, S., 2015, “Key Determinants of Happiness for Developing and Developed Countries: A Panel Data Analysis”. Proceedings of The International Statistical Institute Regional Statistics Conference 2015, Kuala Lumpur (Malaysia), 16-19 November 2015. Wong, C. C., Vaithilingam, S., and Nair, M.(2013), “Attitudes of Different Segments of Consumers towards Mobile Advertising”, Paper accepted for publication at the International Academy of Management and Business (14th IAMB conference, January 21-23, 2013, Texas, USA. Selvarajah,J., Nair, M., Vaithilingam S., and Ng, Jason, (2012) “Financial Inclusion and Sustainable Development of Marginalised Communities in ASEAN: An Exploratory Analysis”, paper presented at the International Congress on Innovation and Regional Economic Development at the University of Science and Technology of China. Wong, C.C., Vaithilingam, S. and Nair, M. (2011), “Adoption of Mobile Advertising: Empirical Evidence from a Malaysian Survey”, Paper accepted for publication at the IEEE International Symposium on Technology and Society (ISTAS, May 23-25, 2011, Chicago, Illinois, USA. Informational Value effect of Syariah Index Original Inclusions and Additions: Evidence form the Malaysia Stock Market”, Paper to be presented in the 2nd IBS Ahmedabad International Conference on Management (IBSA-ICON 07). Vaithilingam, S., Krishnan Guru, B. and Shanmugam, B. “The Role of Commercial Banks in Economic Growth in Malaysia: Lessons for Islamic Bank”, Paper presented at the International Islamic Banking Conference, Prato, Italy, 9th-10th September, 2003. Factors Affecting the Adoption of Internet Banking in Malaysia, Paper Presented at the 7th International Conference on Information Systems Analysis and Synthesis (ISA 2001), Orlando, USA. An Application of The Transportation Algorithm in Selecting Bank Merger Partners (co-authored) (INFORMS \KORMS - Seoul 2000 Conference on Information and Knowledge Management. A Study Of The Seasonal Variations In The Demand For And Supply Of Cash At Commercial Banks: A Malaysian Case Study.’ 12th Australian Finance and Banking Conference, Sydney, Australia, 1999..
Electronic Banking in Malaysia: A Note on the Evolution of Services and Consumer Reactions’ (co-authored) Third Annual Collector Conference, Wellington, New Zealand, 1999. Nair, M., Ahmed, P. Vaithilingam, S., Narayanan, P., Chan, A.W, Lee, D. and Yeng, Hong Qing (2018), “Business Sentiment 2017/2018: A Perspective from Malaysian Executives,” CPA (Australia) and Monash University Malaysia. Vaithilingam. S., Nair., M. Ahmed, Narayanan, P. (2017) Affordable Housing in Malaysia,” Real Estate and Housing Developers Association (REHDA) and Monash University Malaysia. Nair, M., Ahmed, P., Vaithilingam, S., Chan A.W. and Lee, D. (2017), A Study of the Malaysian Plastics Industry: Skills Need, Malaysian Plastics Manufacturing Association, and Monash University Malaysia. Nair, M., Ahmed, P. Vaithilingam, S., Narayanan, P., Chan, A.W, Lee, D. and Yeng, Hong Qing (2017), “Business Sentiment 2016/2017: A Perspective from Malaysian Executives,” CPA (Australia) and Monash University Malaysia. RAM Consultancy Service Sdn. Bhd. Affordable Housing in Malaysia,” Real Estate and Housing Developers Association (REHDA) and Monash University Malaysia. Sustainable ICT Development in 'Urban-Poor' Communities, The Malaysia case. Assessment of the Financial Systems in ASEAN 5 Countries: A Longitudinal Study. Vaithilingam, S., (2018) Local Programme Committee (LPC) Member, International Statistical Institute World Congress (ISI WSC) 2019. Vaithilingam, S., (2018) Panel Discussion at “Clarity Not Confusion Leading Business Direction” at the “Fourth Leap 2018 Conference” at One World Hotel, Petaling Jaya on 22 November 2018. Vaithilingam, S., (2018), Facilitated and presented at the 5 day “Newton Research Link Workshop” from 20 September till 25 September 2018. Vaithilingam, S., (2017), Invited speaker on “Statistic in Public Policy” (ICMS) Malaysian Public Policy Competition (MPPC), (2017), on 19 August 2017 at Sunway University. Vaithilingam, S., (2017) Facilitated for Power Statistics for Decision Makers: Patterns, Prediction and Prescriptive Analytics Workshop from 5-6 April 2017 at Monash University Malaysia. AKEPT workshop: publication writing forum-facilitated in the sessions. Vaithilingam, S. appointed as Institute of Statistics (ISI) representative and liaison person (2014 to current). Vaithilingam, S., FRGS evaluation panel member for Social Sciences and Arts & Applied Arts Research, Monash University Malaysia. Vaithilingam, S., (2018) “Two Day Time Series Econometrics: Unit Roots, Integration & Structural Breaks Workshop at Computer Lab 4, Monash University Malaysia. Vaithilingam, S., (2018) “Multivariate Data Analysis” workshop at Computer Lab (6604), Monash University Malaysia. Vaithilingam, S., (2018) “Power of Statistics for Decision Makers: Patterns, Prediction and Prescriptive Analytics” (Research Method Workshop) for staff and external participants at MUSST Lab, Monash University Malaysia. Vaithilingam, S., (2018) “Introduction to R workshop” at Smart Classroom (9-3-04) at Monash University Malaysia. Vaithilingamn, S., (2016) “Research Method Workshop for staff, external participants at Plenary Theatre, Monash University Malaysia. Vaithilingam, S., (2016) “Organized Econometrics workshops for staff, industry and others (including researchers from other institutions of higher learning. Vaithilingam, S., (2015) “Theory Development Workshop” at Plenary Theatre, Monash University Malaysia, 4 July 2015 (organizer). Vaithilingam, S., (2014) “Theory Development Workshop” at Plenary Theatre, Monash University Malaysia, 28 July 2014 (organizer). Vaithilingam, S., (2014) International Workshop on Mathematical Modelling for Application on “Big Data and the Power of Statistics for Decision Makers: Patterns, Predictions and prescriptive Analytics” at Corus Hotel, Kuala Lumpur, 25-27 November, 2014 (co-organizer for a three day workshop). Vaithilingam, S., (2010) “Organize and conducted CGE Training at Ministry of Finance from the 30th of November to 3 of December 2010. Vaithilingam, S., (2009-2010), assisted in 2 training programs at Ministry of Finance, jointly with Centre of Policy Studies (COPS), Monash University Australia from the 7th of December to 11 of December 2009, 12 of July to 16th of July 2010.